Ocala, FL (October 18, 2016) — Thanks to two new Sentry PEMF Blankets in Chester Weber’s arsenal, Respond Systems – a longtime supporter of Team Weber and Jane Clark’s high performance KWPN geldings – kept the World Equestrian Games Silver Medalist and 13-time National Champion combined driver recharged over his summer CAI European tour. Team Weber finished the summer as the top-placed American team in the 2016 FEI World Four-in-Hand Championships in Breda, the Netherlands. Respond Systems Sentry PEMF Blankets with therapeutic magnetic fields are a cutting edge option in caring for the sore muscles and stiff joints found in today’s equine athletes. 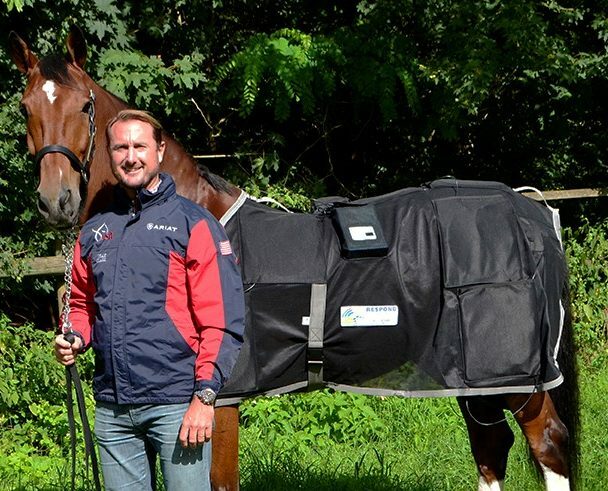 Respond Systems blankets have been utilized by Team Weber since 2009, and help to ensure that Weber and Clark’s horses stay in tip-top shape while facing the world’s most competitive FEI drivers and teams. Team Weber has been equipped with two Sentry PEMF full body suits, a neck piece, and hock boots, courtesy of Respond Systems of Branford, Connecticut. The company has been developing state-of-the-art veterinary therapy systems for horses and small animals since 1989. Sentry PEMF bio-pulse blankets are designed to cover all major muscle groups. With eight large coils, (two for the topline, plus coils for the hamstring muscles and inside the stifle), this is a must-have blanket for the highly athletic, injured or aging horse. Each battery-powered blanket provides up to 20 treatments per full charge. Team Weber began its summer with a solid performance at the CHIO4* Royal Windsor Horse Show in England, then on to Drebkau, Germany to win top honors at its CAI3* tournament, and a third overall in the CAIO4* at CHIO Aachen World Equestrian Festival in Germany before Breda. Now back in Ocala for the fall, Weber is turning his focus to developing a potential new bay to the team, a five year-old KWPN gelding called Governor. Weber and his champion team will head to their next competition, the Hermitage Classic and Fall Festival in Goshen, Kentucky, on October 21-23. For all the news on Team Weber’s latest triumphs and additions to the team, follow the official Facebook and Instagram @ChesterWeber accounts and visit www.ChesterWeber.com. Photo: Team Weber thanks Respond Systems for two new Sentry PEMF Blankets (Photo courtesy of Chester Weber, contact staffwriter@jrprnews.com for full resolution image).